The artist Tsukioka Yoshitoshi literally lived in two worlds and this applies to not only the Edo Period and Meiji Period but also to his chaotic lifestyle. However, despite this, Yoshitoshi produced stunning art and he was extremely productive. Yoshitoshi was born in 1839 and his early life belonged to the feudal ways of the Edo Period. Yet gradually Japan witnessed internal political and cultural convulsions. 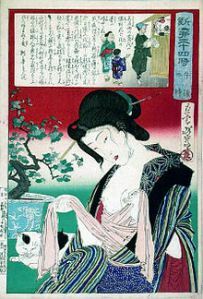 These internal convulsions culminated with the Meiji Restoration of 1868 therefore the onset of modernity was a major challenge for all ukiyo-e artists. Many other individuals also speak with fondness towards Yoshitoshi because he took the challenge head on and simply responded by utilizing his fantastic talent. Therefore, when individuals view his rich legacy it is clear that the ukiyo-e world of Ando Hiroshige and Katsushika Hokusai was very different. However, despite the innovation of Yoshitoshi in the art world and adapting to modernity, his biggest demons were internal because he suffered many dark periods. Indeed, in 1871 he was shackled by severe poverty and until his death in 1892 he struggled with severe bouts of depression. At one point, these internal problems nearly tipped Yoshitoshi over the edge because he had a mental breakdown in the early 1870s. Therefore, you had an artist facing mental problems, deep scars from the past, severe poverty and a rapidly changing world that would impact greatly on ukiyo-e in a detrimental way. Also, the two ladies who cared deeply about Yoshitoshi would be dragged down by him because both would enter the brothel world in order to help him. This was not unusual in Japan during times of severe poverty but the passion that these ladies had for Yoshitoshi wasn’t fully met the other way. In 1884 major changes occurred for Yoshitoshi because he got married and from this period until 1891 he produced some amazing art pieces. Yet the early life of Yoshitoshi remained firmly within his soul because in 1891 he had a major bout of depression and a severe mental breakdown. However, this time he would not recover because on June 9, 1892, he passed away at the age of 53. Yoshitoshi did manage to go home for the last few months of his life but clearly he was nothing more than a shell by this time. 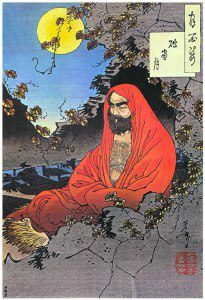 Therefore, the ukiyo-e world lost a great innovator because of the ravages of mental depression and terrible health. Like stated earlier, the years after his marriage in 1884 were extremely fruitful and this notably applies to One Hundred Aspects of the Moon (1885-1892) and New Forms of Thirty-Six Ghosts. Also, in the same period he created other notable works of importance. Given this reality, Yoshitoshi was reaching fresh heights prior to 1891 therefore one can only wonder about what he would have produced in the future if his health had held out. The life of Yoshitoshi is one of great highs and severe lows and in many ways he represents the chaotic period that he belonged to. After all, you had many winners but also many losers who could not adapt to the changing world. However, this wasn’t the case for Yoshitoshi because he was a great innovator. Therefore, the real problems for Yoshitoshi were mental issues and severe poverty and clearly the later made the former even more dangerous. Yet, despite all the odds, Yoshitoshi left a lasting legacy and today his talent is rightly being reviewed and seen in a fresh light. 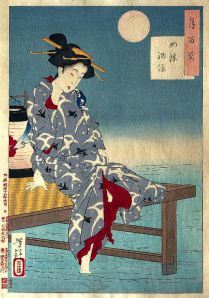 After all, Yoshitoshi was “a bridge” that connects two worlds and his ukiyo-e highlights the intense struggle to survive during the Meiji period. It also shows the power of ukiyo-e therefore Meiji ukiyo-e artists need to be acknowledged more because they brought a new freshness to this amazing art form but this is often neglected in favor of Edo artists. Some art and cultural articles by Modern Tokyo Times are republished based on the need to highlight the unique nature of Japan to our growing international readership.